This Desk Book Clock has a beautiful design with gold components accented by Mahogany. May be propped on a desk or shelf as a decorative office treasure. Order as a retirement gift, birthday gift or award. Inside plaque holds customized text for each recipient. Size: approx. 9" x 6.75" x 2.25"
Order this Rich mahogany finish Desk Book Clock online here today. 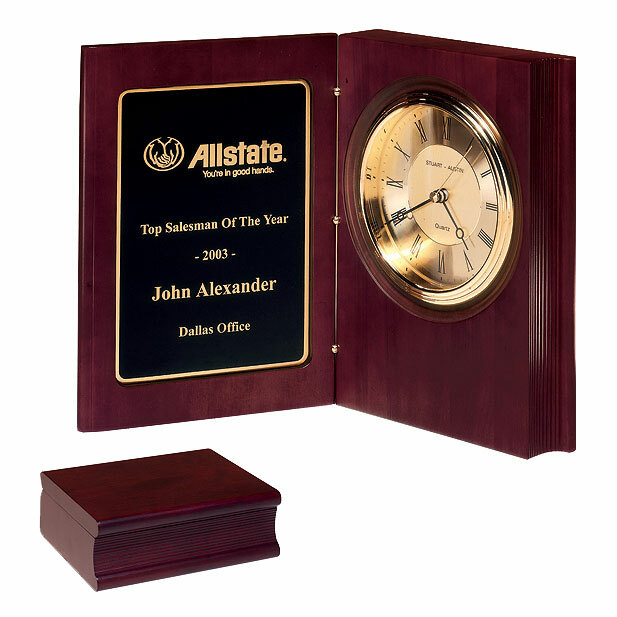 This exquisite desk accessory features a clock with Roman numerals and a customizable plaque. Commemorate employee milestones, honor a university professor, or present as a gift to a life-long friend. Price includes engraving!